Because this post seems to be quite popular with my statistics right now, I thought I would copy it and bring it back for this year as a special Solstice treat for the Friends of the Crossroads. Enjoy it, and may you have a blessed Winter Solstice! 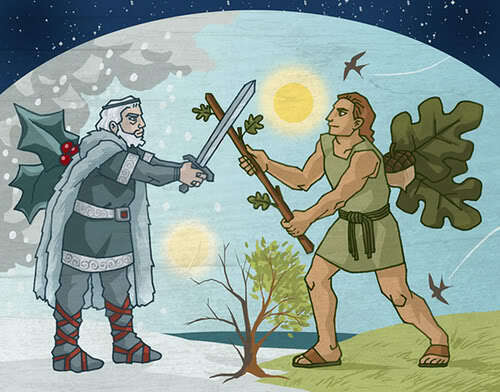 Any discussion of the Winter Solstice and holly from a Pagan perspective would most likely include at least a mention of the battle between the Holly King and the Oak King. For a number of Pagan traditions, this battle represents a central theme surrounding the solstices – the concept of light and dark; of birth, death, and rebirth. Actually, one could consider it two themes, which coincide rather dramatically at the Winter Solstice. These two themes focus on the role which the God-figure plays throughout the year, and especially during the changing of the seasons. To understand these themes, we must first recognize the two distinct concepts which merged together to create the modern-day Wheel of the Year : the solar concept and the natural-fertility concept. The solar concept, as its name implies, is sun-based… we can observe it on a daily basis as we watch the sun rise and set, and view the dominance of the Sun God during the solstices and equinoxes. He dies and is reborn at the Winter Solstice (Yule), begins his maturity at the Spring Equinox (Ostara) when he impregnates the Earth Goddess, peaks in a blaze of glory at the Summer Solstice (Litha), and begins to wane in his power around the Fall Equinox (Mabon). On the other hand, the natural-fertility concept is more complex, involving two God-figures: the God of the Waxing Year and the God of the Waning Year. The Waxing God is also known as the Oak King, and the Waning God as the Holly King. Although rivals, they are also considered to be twins – each other’s “other self,” the light and dark aspects of the male deity. By “light and dark” we are not referring to good vs. evil. Rather, they refer to the two phases of the yearly cycle… that light time when the Sun-God in his Oak King aspect is growing in his fertile power, the days get longer, and we can view the rich abundance of the earth; as opposed to the darker half when He as the Holly King is losing his power, the days grow shorter as the night takes over, and the earth lies fallow and still. The twins compete with each other for the favor of the Earth Goddess; each serves as her child, consort and lover during his half-year reign – he mates with her, dies in her arms, and is then born of her to carry on the never-ending cycle. This relationship is particularly born out at the Solstices, when the Holly King and the Oak King do battle with one another, and one of them must then die, that the other may reign in his place. 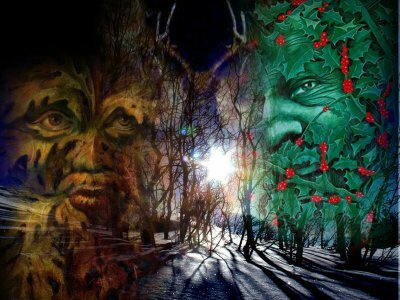 Thus does Yule not only mark the death and rebirth of the Sun-God; it also marks the vanquishing of the Holly King, God of the Waning Year, by the Oak King, God of the Waxing Year. The Goddess, who was Death-in-Life at the Summer Solstice, now becomes Life-in-Death at the Winter Solstice – even though she is the queen of the cold darkness, she also the Great Mother who gives birth to a child of promise, who brings back light and warmth to the earth. 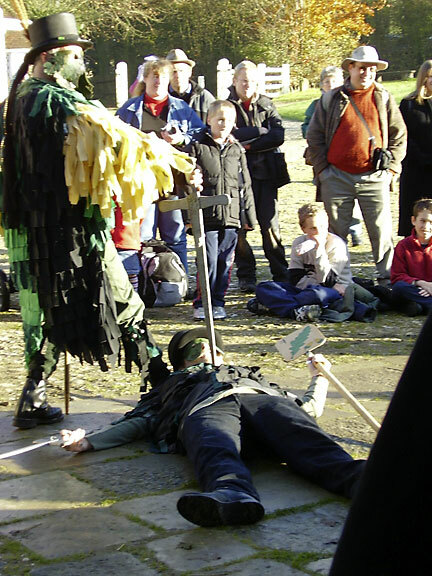 In some Pagan traditions, the battle of the kings is acted out during the Sabbat rituals celebrating Yule (the Winter Solstice, also known as Midwinter) and Litha (the Summer Solstice, also known as Midsummer). Two individuals (usually men) are selected to portray the Holly King and the Oak King. Oftentimes the High Priestess will place a crown of corresponding leaves upon their heads before they commence with their mock duel. Now at the depth of winter is the waning of the year over, and the reign of the Holly King is finished. The sun is reborn, and the waxing year begins anew. My brother (the Holly King) is now dead, and has left us to rest in Caer Arianrhod, the Castle of the Silver Wheel, until the Summer Solstice when he shall return to rule again. May the Wheel of the Year continue to turn, the seasons continue to change, and the sun always be with us. So Mote It Be! Some may be confused that at a time when our halls are decked with holly, we are actually celebrating the death of the Holly King, rather than his birth. However, one should think of those holly wreaths as mourning wreaths, and remember the whole theme and the cycles: even though in the middle of July it may seem difficult to imagine that that it’s the waning year, we must recall that the longest day actually took place on June 21st; consequently the days get shorter and by December 21st much of the world lies cold and barren. By the same token, it might be hard to think of the middle of February as being the waxing year, but we have to remember that the days are growing longer and Spring is just around the corner. Light and dark, life and death. A time to grow and expand, and a time to withdraw and rest. This is the lesson of the two kings, the twin brothers. As we celebrate the holiday season, let us not forget the presence of the Holly King and the Oak King in our lives, and remember that in the midst of the struggles we must all occasionally endure, comes the opportunity to learn and discover new strengths and new possibilities. With the death of the Holly King at the Winter Solstice, we begin a new waxing year and a chance at new growth.